This wrist tool lanyard with a 30cm elasticated swivel and Velcro fastening is made by Leading Edge in the UK. Design is optimised to prevent twisting with intense usage and is suitable for multiple applications. With the added benefits of an elasticated lanyard; to reducing tripping, snagging hazards and lowers impact force from a dropped tool. Tool wristbands are a great option for repeat use of a single tool usage. Anchoring to your wrist means you can release your tool to free up your hand for other activities and pick-up it again whenever you need. All our wristbands have ergonomic Velcro fittings that can be easily adjusted with one hand, but unlike other wristbands they have three unique features: expansion joints, over-lock and retainer loop. Besides providing extra comfort the safety expansion joint stretches to 9cm with extreme force. This allows emergency release of the hand should the wristband become caught in a hazard. The Velcro over-lock and retainer loop add further protection by preventing accidental unfastening and securing strap overhang. 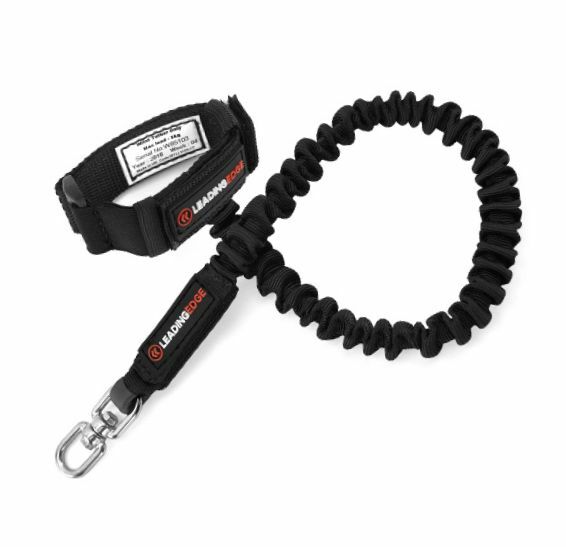 This wrist lanyard is fitted with a very secure rated Velcro fastening system, allowing faster adjustment and is simpler to put-on and take-off when using multiple pre-tethered tools. The Velcro is manufactured from industrial grade synthetic Polyester, and has a water and UV resistant structure that does not fade or weaken (if maintained in-line with our care instructions) as such design is compact, hard wearing and has a long life in arduous environments.